A family which played an important part in the earlier annals of the Canadian Jews. 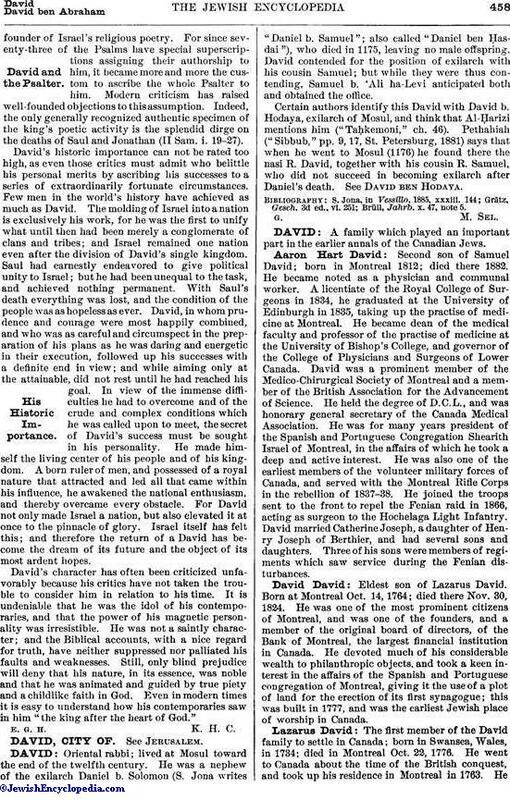 Second son of Samuel David; born in Montreal 1812; died there 1882. He became noted as a physician and communal worker. A licentiate of the Royal College of Surgeons in 1834, he graduated at the University of Edinburgh in 1835, taking up the practise of medicine at Montreal. He became dean of the medical faculty and professor of the practise of medicine at the University of Bishop's College, and governor of the College of Physicians and Surgeons of Lower Canada. David was a prominent member of the Medico-Chirurgical Society of Montreal and a member of the British Association for the Advancement of Science. He held the degree of D.C.L., and was honorary general secretary of the Canada Medical Association. He was for many years president of the Spanish and Portuguese Congregation Shearith Israel of Montreal, in the affairs of which he took a deep and active interest. He was also one of the earliest members of the volunteer military forces of Canada, and served with the Montreal Rifle Corps in the rebellion of 1837-38. He joined the troops sent to the front to repel the Fenian raid in 1866, acting as surgeon to the Hochelaga Light Infantry. David married Catherine Joseph, a daughter of Henry Joseph of Berthier, and had several sons and daughters. Three of his sons were members of regiments which saw service during the Fenian disturbances. Eldest son of Lazarus David. Born at Montreal Oct. 14, 1764; died there Nov. 30, 1824. He was one of the most prominent citizens of Montreal, and was one of the founders, and a member of the original board of directors, of the Bank of Montreal, the largest financial institution in Canada. He devoted much of his considerable wealth to philanthropic objects, and took a keen interest in the affairs of the Spanish and Portuguese congregation of Montreal, giving it the use of a plot of land for the erection of its first synagogue; this was built in 1777, and was the earliest Jewish place of worship in Canada. The first member of the David family to settle in Canada; born in Swansea, Wales, in 1734; died in Montreal Oct. 22, 1776. He went to Canada about the time of the British conquest, and took up his residence in Montreal in 1763. Hewas one of the founders of the Spanish and Portuguese Congregation Shearith Israel of Montreal, and was one of the most active organizers of the earliest Canadian-Jewish community. He also took a prominent part in the political affairs of his day, and was an extensive landowner in Montreal. His is the oldest Jewish grave in Canada. He was married in Rhode Island, in 1761, to Phœbe Samuel, who was born in England in 1736 and died at Montreal in 1786. He had three sons, David, Samuel, and Moses, who were all prominent in Canadian communal affairs, and two daughters, Abigail and Fanny (Frances). 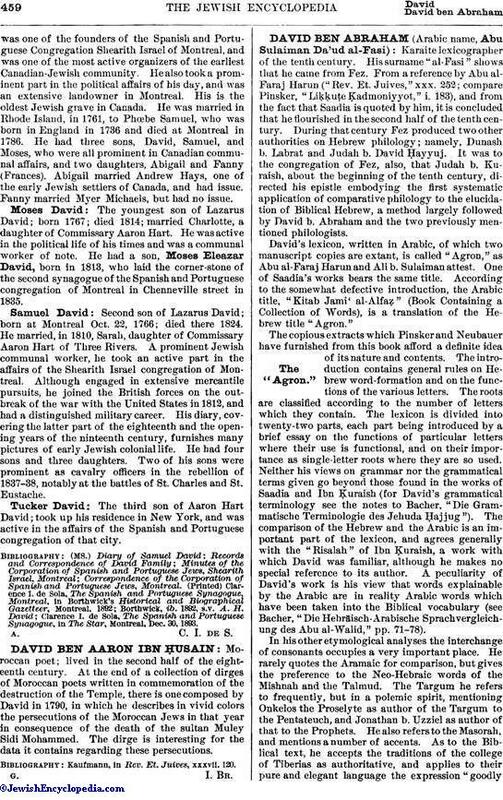 Abigail married Andrew Hays, one of the early Jewish settlers of Canada, and had issue. Fanny married Myer Michaels, but had no issue. The youngest son of Lazarus David; born 1767; died 1814; married Charlotte, a daughter of Commissary Aaron Hart. He was active in the political life of his times and was a communal worker of note. He had a son, Moses Eleazar David, born in 1813, who laid the corner-stone of the second synagogue of the Spanish and Portuguese congregation of Montreal in Chenneville street in 1835. Second son of Lazarus David; born at Montreal Oct. 22, 1766; died there 1824. He married, in 1810, Sarah, daughter of Commissary Aaron Hart of Three Rivers. A prominent Jewish communal worker, he took an active part in the affairs of the Shearith Israel congregation of Montreal. Although engaged in extensive mercantile pursuits, he joined the British forces on the outbreak of the war with the United States in 1812, and had a distinguished military career. His diary, covering the latter part of the eighteenth and the opening years of the ninteenth century, furnishes many pictures of early Jewish colonial life. He had four sons and three daughters. Two of his sons were prominent as cavalry officers in the rebellion of 1837-38, notably at the battles of St. Charles and St. Eustache. The third son of Aaron Hart David; took up his residence in New York, and was active in the affairs of the Spanish and Portuguese congregation of that city. Clarence I. de Sola, The Spanish and Portuguese Synagogue, in The Star, Montreal, Dec. 30, 1893.